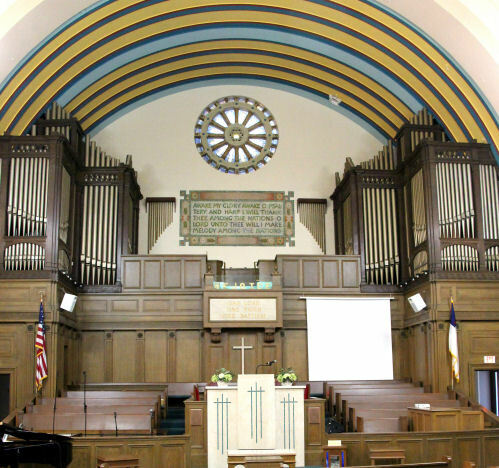 The large glass mosaic in the choir loft of the Euclid Avenue Temple was created by the Tiffany studios in New York and dedicated, with their new building at 8206 Euclid Avenue, on March 22 - 24, 1912. 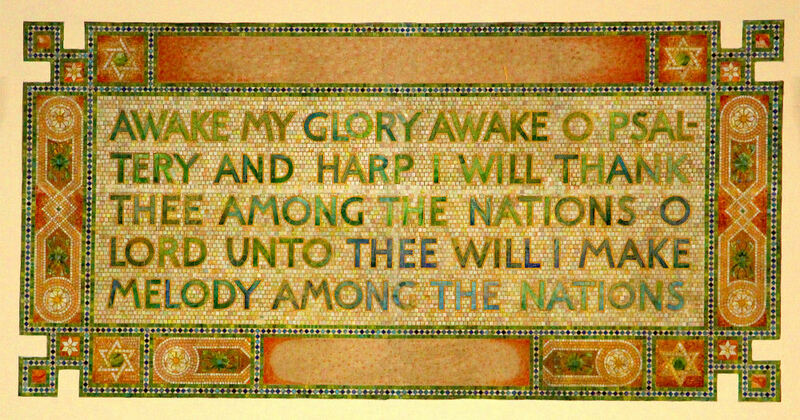 On the wall in the front of the sanctuary, between the pipes of the organ, then the largest in the city, made by the M. P. Moeller company of Hagerstown, MD, hangs the glass mosaic by Tiffany. According to a listing of gifts published in the March 29, 1912 Jewish Review & Observer, it was given in memory of Adolph and Nina Mayer by their daughters Fannie (Mrs. N. I. Dryfoos), Flora (Mrs. Alfred Wolf) and Amanda (Mrs. Frank Strauss). Some worshippers in this Reform synagogue, aware that religious services at more traditional congregations did not include music and a choir, may have welcomed the text of the mosaic. It is from a Psalm of David -- Psalm 57 lines 9 and 10. Its words show that combining prayer, song and music is not a modern innovation. The custom is described in this and many other texts in the Jewish bible. Several weeks ago we received an email from the Metropolitan Museum of Art. They wished to consider including an image of the mosaic Tiffany Studios had created in 1911 for the Euclid Avenue Temple in a scholarly art book they plan to publish. The records of this Tiffany project had been found by art and architecture historian Tricia Pongracz. (See the note on our Tiffany Windows page.). With the permission of the Liberty Hill Baptist Church, Robert N. Brown took the two pictures shown above. To minimize distortion he took the picture of the mosaic from the balcony at the rear of the sanctuary using a tripod-mounted Canon digital SLR camera with a 300 mm telephoto lens. We sent print quality images, each larger than 12 Mb, to the museum image acquisition editor Elizabeth De Mase. A few days ago we were pleased to learn that the image of the mosaic will be in the "Metropolitan Museum of Art Journal" to be published by year end..
We received a call from the editor of publications of the Corning Glass Museum. Could we furnish information on who gave the funds for the mosaic and who was being remembered by the gift. We were able to obtain that information, send it on along with Mr. Mayer's obituary, and add it to this page. Aren't such exchanges of facts a modern wonder? Thanks to the Liberty Hill Baptist Church for their permission to take these photographs.